Sea Urchin Linguine – Fresh, Fast, and Fantastic! In our never ending quest to demonstrate the creamy goodness that is the red sea urchin, we present for your dining pleasure a delicious and easy preparation that will help you get your strut on whenever you go diving. In a short 25 minutes, you and 3 friends can be enjoying a delicious pasta that tastes of the Pacific. In a blender, puree the sea urchin with 2 tablespoons of the olive oil until smooth. In a pot of heavily salted boiling water, cook the linguine until al dente, as per the instructions. Meanwhile, in a deep skillet, heat the remaining 2 tablespoons of oil. Add the chard and cook over moderately high heat until wilted, about 3 minutes. Drain the linguine, reserving 5 tablespoons of the cooking water. Add the linguine to the skillet with the sea urchin puree and 2 tablespoons of the cooking water and toss over moderate heat for 30 seconds. Off the heat, add the remaining 3 tablespoons of cooking water and toss. 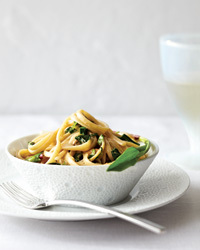 Transfer the linguine to bowls and serve. Top with chives and salt and pepper to taste. Serve it with a nice white wine and you’ve got something that’s fresh, fast and tastes of the sea. Enjoy. Previous Previous post: Who would’ve thought Sacramento could be the capital of anything?